Prismatic crystal is terminated with the three faces, very sharp, of the rhombohedron. Blue color and excellent transparency, which is adequately shown by the picture. Very transparent prismatic crystal with a rough termination. The blue color is especially intense, well defined and uniform throughout most of the prism. Estremely elongated crystal, with an excellent termination, with very well defined faces and edges. The crystal is very transparent and has an excellent blue color, very well defined all along the prism, with greenish tones in the terminal zone. 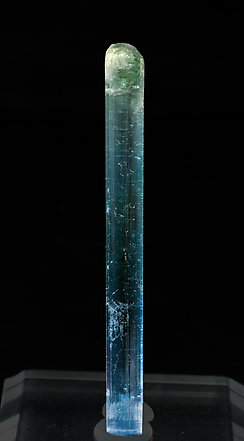 Sharp Indicolite crystal showing a very striated top termination and a recrystallized bottom one. The specimen shows throughout a deep and uniform blue color. As a matrix, a strongly deformed but complete Quartz crystal. 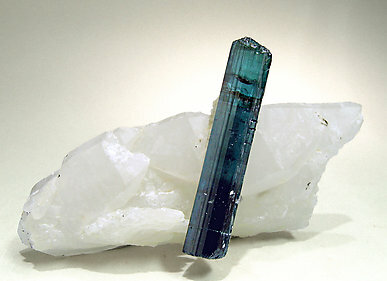 This Indicolite specimen is exceptional for its quality and for being on matrix. 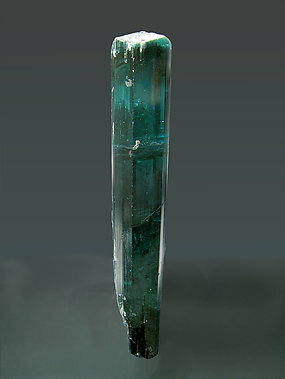 Translucent crystal of very intense and uniform blue color, with a good pinacoidal termination showing a very well marked geometric color zoning, very deep blue on the center of the crystal. On Quartz matrix and with Muscovite. 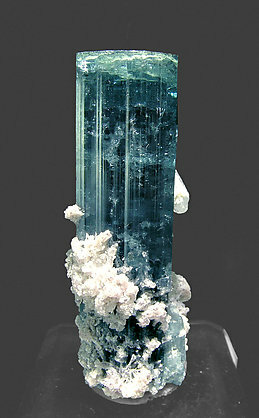 Single Elbaite crystal with flattened forms and very well defined parallel growths. 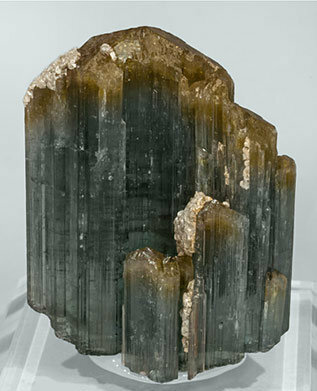 The crystal, partially coated by Muscovite, is translucent, with an intense and uniform blue color on the prism faces and is greenish yellow on terminal faces. Very unusual. A crystal with simple forms including the very well-marked curved trigonal prism and smooth pinacoidal termination. 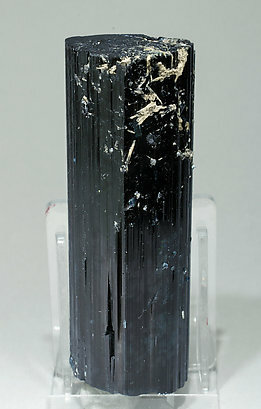 It has a very intense, uniform and deep blue color, masked by the crystal's thickness but easily visible with an intense light. Prismatic crystal of very well defined faces and edges, both on the prism and on the pinacoidal termination. 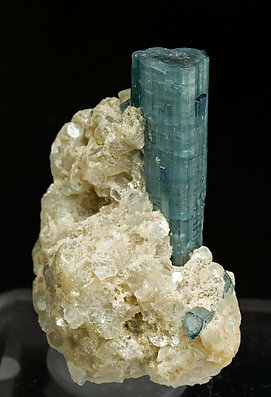 The crystal has a rich blue-green color and a considerable transparency (under intense light) and it is partially covered by Lepidolite and Quartz crystals. Scepter growth of a double parallel prism with a complex termination with rhombohedral faces. 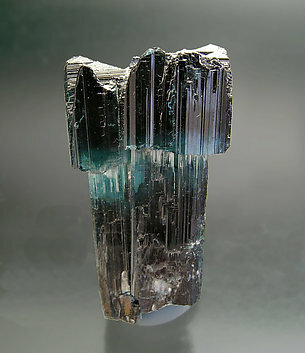 Its color is extraordinary, deep blue without green shades, so common in this type of crystal.